Appartement met 4 bedden / 2 slaapkamers. Gaan wandelen, vissen op forel, gletsjer en rotsklimmen. 2 soverrom, 1 badkamer met wasmachine, woonkamer met TV, keuken met fornuis en koelkast. Dalbu Appartement idyllische plek in Bodal. Goede mogelijkheden om te gaan wandelen in de omgeving. Ook gelegenheid voor gletsjer klimmen en alpinisme. Beddengoed, elektriciteit, water en eindschoonmaak zijn inbegrepen in de prijs. 5 km tot Bodal Sætra. 1 km tot Lovatnet, die zorgt voor forelvissen. Perfect holiday home! We felt very welcome! Our stay in the holiday home on the Lovatnet lake near Loen was perfect! Our hosts were a very sweet and hospitable couple and we felt very welcome. They spoke almost excellent English. The holiday home was on the first floor of a very authentic and beautiful Norwegian house. The house had everything we needed: a kitchen with all the cooking utensils, a cosy living area with tv, a perfect bedroom with lots of storeroom, a balcony with chairs and a table, and a beautiful bathroom. The washing machine was also very convenient. The holiday home was spotless clean. The location of the home could not be better: the Lovatnet lake looked heavenly! The colour of the water was so beautiful and the quietness and piece were unprecedented. We would highly recommend a stay at the Lovatnet lake! We enjoyed out time with hiking (Kjenndalen glacier and other beautiful routes), fishing in the lake (tasteful trout) and the Nordfjord, and just enjoying the peacefulness of the surroundings. The nearest place to visit is Loen (small village with some touristic information and a supermarket) and after that Stryn (a bit more vibrant, all kind of shops etc.). We also visited the Geirangerfjord from our holiday home: a beautiful route by car. What made out stay special were our sweet hosts: we loved talking to them and we even went out fishing together! We would definitely come again and recommend this holiday home! Thank you so much for your kind review! It is very helpful to others who are searching for a nice place to stay. We look forward to welcoming you again! Flott , passelegg stor leilighet. Grei beliggenhet. Koselig vertskap.Me hadde nokre hyggelige dagar. Kan trykkt anbefalast. A brilliant place. Our best stop in Norway. Jorunn and Magne were so kind and helpful, they made our stay totally memorable. We had a fantastic week in this beautiful scenery. The place is absolutely amazing, the house well situated, only a few minutes by car to the glaciers and trecking possibilities. The appartment is typically norwegian and very cosy. But the best for us was to have the opportunity to meet the most delightful hosts we have ever had, Jorunn and Magne. The landscape was breathtaking, we enjoyed the view from the balcony. The flat is big enough for 4 people and is so clean. The owner of the flat, who live downstairs, are so lovely and friendly. We can recommend this flat to all. This is such a great location. There is beauty around every corner. The accommodations were clean and comfortable. The views of the surrounding mountains were remarkable. The sounds of the rushing river nearby. Our hosts, Magne and Jorunn were so kind and a pleasure to visit with. They checked in periodically to make sure we were doing well. Magne even invited us out to set the fishing nets with him from the boat. It was a great experience. There is so much to do and see in this region. 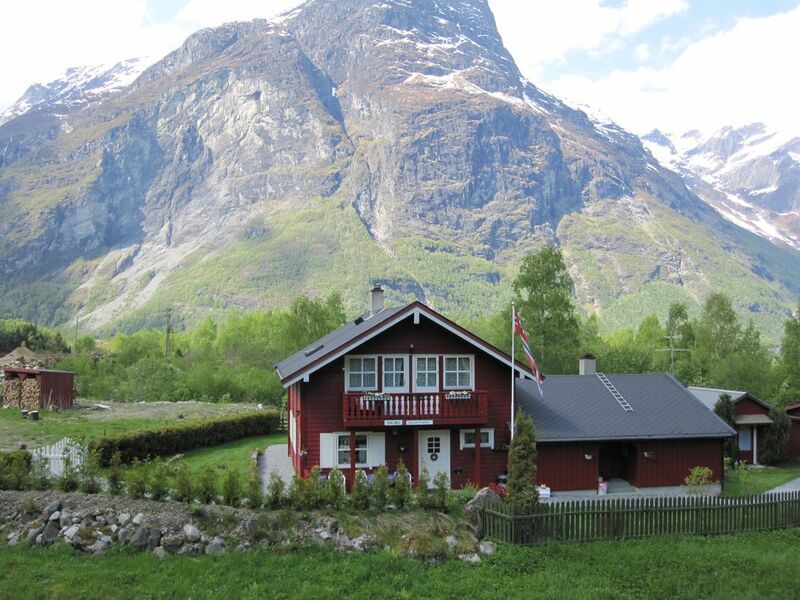 Norway is a beautiful country and this is a great place to stay. Priser kan endres inntil reservasjonen er bekreftet.